Here comes the weekend! AND the 2012 Summer Olympics! I hope you're as excited as I am for all of the events. Gymnastics is my particular favorite! Today, I'm rocking an indie polish I received in a secret swap I participated in. My awesome partner sent me this lemming of mine, made by Rainbow Honey. I LOVE the fact that Rainbow Honey is created in my home state of New Jersey. Mare of the Moon comes from the Equestria Collection, the shades from which are all inspired by My Little Pony! 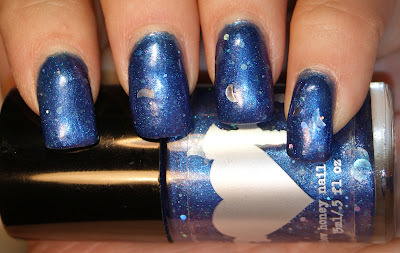 Mare of the Moon is a blue-purple duochrome polish with varying sizes of hexagonal glitter and silver moons. It has a beautiful sheen to it that always managed to catch the light. Here, you can see the shift from the blue to purple a little bit better. It was a little difficult to capture on camera, but was a lot more prominent in person. The only issue that I had with this polish is that it was super thick and gloppy in the bottle. I was afraid to add thinner because of how temperament some shapes can be. If I made those moons curl, I'd be pretty upset. It wasn't unworkable, it was just difficult. Mare of the Moon, and the rest of the Equestria Collection, can be purchased at RainbowHoney.com. The 15ml bottles retail for $10 and the 7ml bottles retail for $5. See you all in the AM! And stay tuned for an announcement about an awesome nail art contest coming up!